Website owners can take advantage of the many different types of infographics to illustrate all sorts of different information, using the infographics to supplement or even replace some more traditional content on their site, and also as promotional tools to capture interest and increase traffic. By using eye-catching graphics instead of plain text, infographics are powerful tools for engaging with readers and this can have far-reaching benefits for websites. From flow charts to graphic timelines, "versus" comparisons to visual representations of statistics, infographics are an incredibly versatile way to present information in a more interesting manner to website visitors. 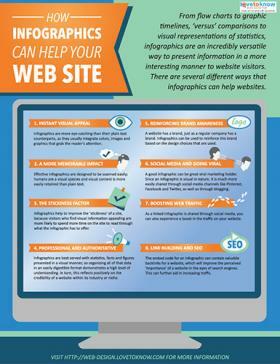 There are several different ways that infographics can help websites. The attention span of the average Internet user is getting progressively shorter, so it's very important to capture their interest as quickly as possible. Infographics are more eye-catching than their plain text counterparts, as they usually integrate colors, images and graphics that grab the reader's attention. Effective infographics are designed to be scanned easily. The reader can simply skim through the graphics to extract the information that interests them. Humans are a visual species and visual content is more easily retained than plain text. With the growing amount of content on the web, it is more important than ever to make a memorable impression. One of the challenges faced by website owners is that visitors can very easily move on to a different website. Infographics help to improve the 'stickiness' of a site, because visitors who find visual information appealing are more likely to spend more time on the site to read through what the infographic has to offer. If they find value in the infographic, they may be more inclined to check out what else is on the site. Infographics are best served with statistics, facts and figures presented in a visual manner, so organizing all of that data in an easily digestible format demonstrates a high level of understanding. In turn, this reflects positively on the credibility of a website within its industry or niche. A website has a brand, just as a regular company has a brand. Infographics can be used to reinforce this brand based on the design choices that are used. Color schemes are a good example of this. For example, an appropriate infographic from LoveToKnow may use mostly blue with highlights in red and orange to coordinate with the site's logo and color scheme. Infographics will usually contain the corresponding company logo too. A good infographic can be great viral marketing fodder. Since an infographic is visual in nature, it is much more easily shared through social media channels like Pinterest, Facebook and Twitter, as well as through blogging. What's more, "articles with images get 94% more views" than ones that don't have images and this kind of visual content is far better at driving reader engagement than text-based posts. Some software can generate easy embed codes for infographics so they can be shared on other websites for additional viral appeal. As a linked infographic is shared through social media, you can also experience a boost in the traffic on your website. In the short term, this is related to people coming to view the infographic itself or to follow up on any related material you may have, but in the long term, those links can continue to generate traffic well into the future. Indeed, according to UnBounce.com, infographic search volume on Google increased by over 800% between 2010 and 2012 and publishers who use infographics grow an average of 12% more traffic than those who don't. Since infographics lend themselves to being shared over the Internet and have the increased potential to go viral, they also present a number of benefits in regards to search engine optimization. The embed code for an infographic can contain valuable backlinks for a website, which will improve the perceived 'importance' of a website in the eyes of search engines. This can further aid in increasing traffic. Websites have a lot to gain from infographics. They can help to develop greater credibility, improve social media performance and ultimately increase website traffic too. With the many tools to create infographics available, it is easier than ever to visualize data and information in a far more engaging way.